Ovine prices trying to build momentum. Home > Sheep > Ovine prices trying to build momentum. 27 Mar Ovine prices trying to build momentum. Sheep and lamb prices continued a muted upward trend this week, with increases in values across all trade lamb indicators. 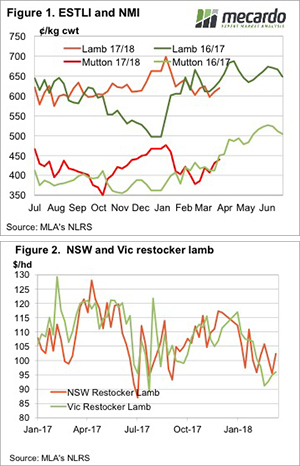 Mutton values were also higher everywhere except WA, and restockers came back to the market for light lambs. Figure 1 shows that the Eastern States Trade Lamb Indicator (ESTLI) and the National Mutton Indicator (NMI) are very close to last year’s levels. Additionally, both lamb and mutton prices appear to be following a similar trend in recent weeks, rising from pre-labour day lows to post a few weeks of gains. There has been reports of stronger demand for light lambs for Greek Easter demand, and this should continue for a week or so yet. Greek Easter is on the 8th of April this year. Mutton supplies have been on the wane, and prices are finding strength, up above 10% over the last month. Victoria and NSW both have mutton values over 440¢, but in the west prices lost 41¢ this week to hit 379¢/kg cwt. Restocker lambs were the biggest mover. The Eastern States Restocker Indicator gained 36¢ on Thursday, and 44¢ for the week. This could have something to do with stronger light lamb demand, but restockers might have read our article from earlier in the week. In NSW 16kg restocker lambs moved back above $100/head (figure 2). An interesting stat is restocker lambs are still around 10% cheaper than this time last year, despite finished lamb prices being similar. 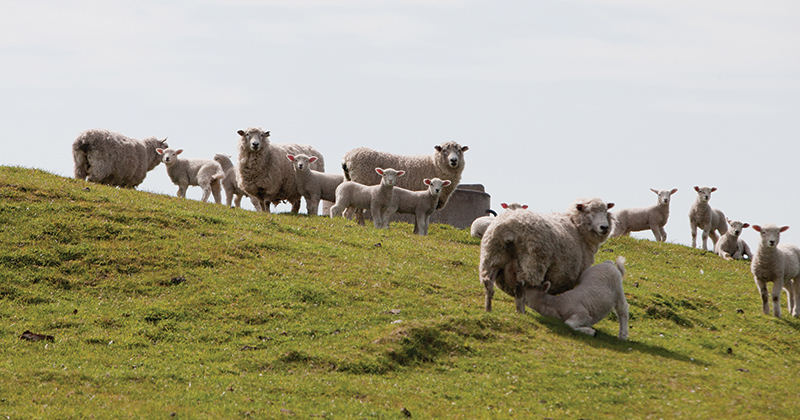 The more expensive grain, and lack of green feed, is no doubt dampening demand for restocker lambs in the current market. With Easter coming up, and the associated disruptions in lamb kills, it’s going to be a risky week for selling stock in the saleyards. Prices could spike, like they did at Wagga today, if processors don’t have enough stock booked up, but the closer we get to next Friday the smaller the amount of kill space available. There’s not any real rain on the forecast, and if it stays dry there is a risk of more growers destocking as feed supplies dwindle.